BUNDUKI is a sport boat built to Australian John Georgalas’s Deep V 16’ design. That boat was raced with great success, including a victory in the six-hour Paris Race. Wynn subsequently collaborated with Walt Walters and Don Aronow on a production version, the Ski Sporter, which was later dubbed, and became much better known as, the Sweet 16. That was the first boat built by Aronow’s company, Donzi Marine, after it was formed in 1964. BUNDUKI, the latest incarnation of the Deep V, is powered by a two-stroke, 130-hp engine harvested from a Kawasaki Jet Ski. Joe Youcha wants you to build a boat. He and his shop crew had built 100 different boats with members of the community, but none that he considered perfect for introducing the public to the joy of building, and the math that goes along with it. He wanted a boat that could be built anywhere by anyone. 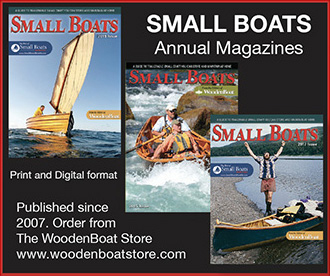 He decided on the most unassuming of American traditional small craft forms, the humble flat-bottomed skiff. When he found a design he liked he wanted to name the boat UBIQUITOUS, but the shop crew insisted it be named after the Shop Supervisor: Joe's dog, Bevin. At Portland, Oregon’s, Cathedral Park, the Willamette River was flowing gently, leaving barely discernible eddies around submerged pilings a few yards from the beach. 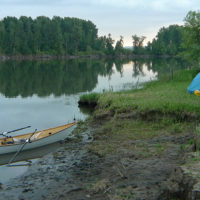 Skamakowa was 75 miles downstream and I had five days to get there relying on the current and a pair of oars. As I swung into the Willamette's current under the long shadow of St. Johns Bridge, I pulled hard to get away from diesel and car exhaust, ski boats, and boom boxes, and headed to the other side of the river. The manual bilge pump that I use for my kayak isn’t very useful aboard my other boats. 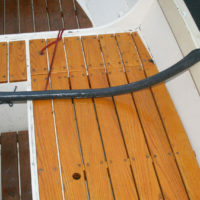 Without a hose it can’t get the water from the centerline some 3’ to the gunwale and overboard. My other pump, the one with a hose attached, went missing one day and I came up with a way to add a nice long hose to my kayak pump. I had an old bicycle inner tube that was just the right diameter to stretch over the spout of the pump. As a hose, it worked like a charm. 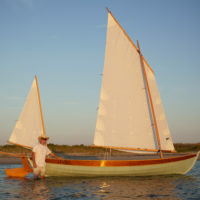 UNA is a double-ended yawl built by Eddie Breeden in his garage in Midlothian, Virginia. His “obsessive daydreaming” led to a multitude of details that make his Sooty Tern like no other. SnowPeak’s Pack &Carry Fireplace offers us a way to enjoy the benefits of a campfire and leave the land as we found it. It folds up for easy storage and transport and, made of heavy-duty stainless steel, it’s built to last. 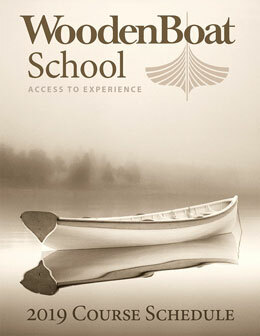 On the water, you may know who, what, and where you are, but after dusk, that may not be apparent to other boaters. Illuminating your presence becomes not only prudent, but US Coast Guard required.